This issue of Clinics in Geriatric Medicine, guest edited by Drs. Michael Malone and Kevin Biese, is devoted to Care for the Older Adult in the Emergency Department. 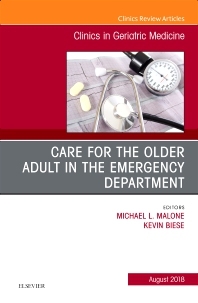 Articles in this outstanding issue include: Approach to the Older Patient in the Emergency Department; Ten Best Practices for Older Adults in the Emergency Department; Delirium and Dementia; Falls and Geriatric Trauma; Older Adults in the Emergency Department with Frailty; Communication Strategies to Better Care for Older Individuals in the Emergency Department; Systems-based Practice to Improve Care Within and Beyond the Emergency Department; Common Medication Management Approaches for Older Adults in the Emergency Department; Elder Abuse and Neglect; Care of those with end-of-life needs / Advanced illnesses in the Emergency Department; Behavioral Health Needs of Older Adults in the Emergency Department; and Pain Management Strategies for Older Adults.